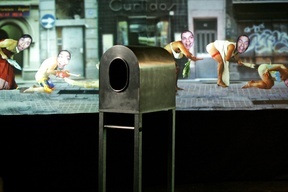 The Tantal installation consists of an interface, which captures the spectator's face, coupled to a computer system that sticks the face onto an actor's body in a film shown on a panoramic screen. Marcel.lÌ firmly believes that the interaction protocols that require audience participation should be as intuitive as possible so Tantal proposes a simple yet efficient answer. The user simply has to place his/her face in the interface opening, then activate the recording with his/her voice and wait two seconds for the capture to finish. Immediately after this a new scene begins with the new face. The film is a loop with eight scenes. Tantal was produced by the Festival @rt Outsiders and initially presented in one of the exhibition rooms in the Maison EuropÈenne de la Photographie in Paris in September 2004. It was chosen by the MEP to represent it at the Nuit Blanche in Paris, and on this occasion the installation was set up in the street. The theme of the fourth edition of @rt Outsiders was Censure and this was the starting point for Tantul. The device functions like a mirror placing the user in front of an unexpected body and thus it becomes a mechanism for transitory identity. The film shows images with dirty, deformed, violent and sexual bodies and these make up the narrative thrust. The spectator accepts his/her new identity but as the action progresses, s/he sees him/herself involved in situations along with the other users. At this point, the installation becomes a relational device that triggers the most unexpected reactions. Graphic Assistents: Marcos Àlvarez, Anna Paretas, Roger la Puerta, Amalia Ortells, Markus, Salvador Cuellar & Pamela Martínez. Face capture interface: camera, light system, body sensor, voice sensor, metalic structure. Sound system. Projection System. Cables.